Every year, 1 million people die from malaria, more than 4 million from respiratory infections, 3 million from intestinal infections and 5 million due to AIDS and tuberculosis. Also, other sexually transmitted and parasitic infections in tropical regions are responsible for hundreds of thousands of deaths. Over 95% of these deaths occur in developing countries, as pointed out in the scientific article Diagnostics for the Developing World, published in Nature Reviews in 2004. “Simple, accurate and stable diagnoses are essential to combat these diseases. However, these are usually beyond the reach of those who need it most”, the authors of the publication reported. Traditionally, major infrastructure -such as hospitals or laboratories- is required for the proper diagnosis and treatment of diseases. Nevertheless, in recent years new techniques have been developed with the aim of speeding up the treatment of diseases affecting developing countries, without the need to rely on large health infrastructure. This has led to the development of Point-of-care tests (POCT), low-cost medical tests that provide results almost instantly and which “are the best way to reach places where access to the health network is challenging”, as explained in the scientific paper entitled Point-of-Care testing for infectious diseases: diversity, complexity and barriers in low and middle income countries, published in Plos One in 2012. POCTs enable healthcare professionals to quickly obtain test results from patients, so that the diagnosis or intervention is started off at the first clinical encounter. The scientific community recommends that POCTs should meet the ASSURED criteria, whose acronym stands for affordable, sensitive, specific, user friendly, rapid, robust, equipment-free and delivered. The heterogeneity of POCTs is broad and is presented through various devices. There are first, second and third generation instruments. 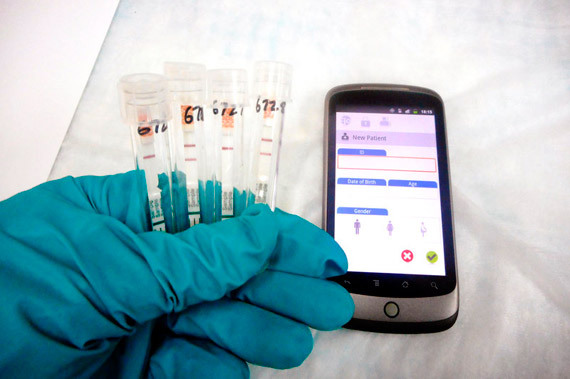 First generation devices are called Rapid Diagnostic Tests (RDT); these are very cheap devices -up to a dollar per test- and most of them meet the ASSURED criteria. 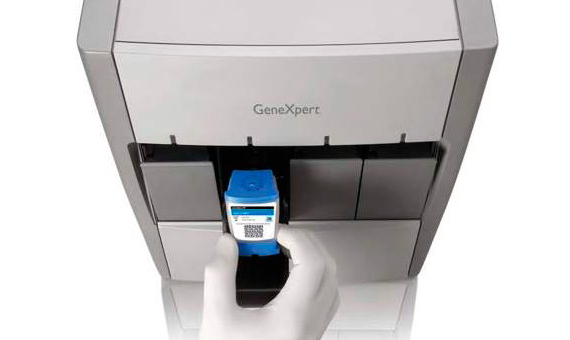 Second generation devices enable professionals to perform nucleic acid amplification tests (NAAT) in order to detect the genetic material of the virus or infecting organism. Finally, third generation devices use mobile technology. They are, for instance, devices that can be connected to a low-end mobile phone (2G technology) in order to send data to other sources. Here are some of the most recent POCTs (many of them are still at a preliminary study phase and have not been launched yet). 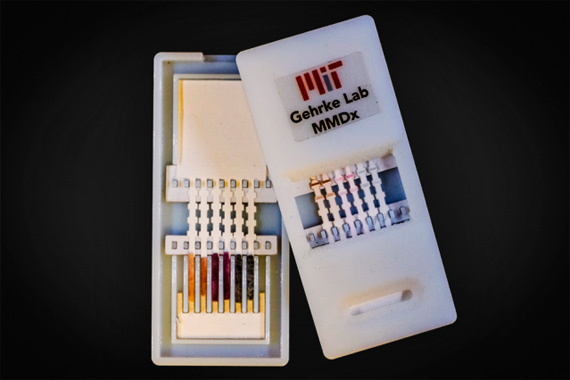 Scientists from the Whitesides research group at Harvard have developed a 25-USD-device -which could become cheaper if mass produced, according to the researchers- to analyze blood samples or water supplies. The device is intended to diagnose cases of diabetes and malaria, as well as detect water pollutants. In a second phase, study could be extended to HIV, Ebola, E. coli, hepatitis, influenza or dengue. A single drop of blood (or water) on a paper strip -that is then inserted into the device- is enough to perform a diagnosis in a question of minutes. The device is connected by cable to a mobile phone –not necessarily a latest generation one, 2G will suffice- so that servers can upload the data. Thus, from anywhere in the world, other healthcare staff can manage the diagnosis and treatment of patients. Another student from the Whitesides work group at Harvard recently presented a method for improving the diagnosis of Sickle-cell disease –an abnormal growth of red blood cells- in developing countries. In the US, 1% of the children detected with this disease die before the age of five, whereas in Africa the average increases to 70%. Last month, the WHO approved the use of a new device –Reebov antigen Rapid Test -developed by Corgenix, which diagnoses Ebola cases in just 15 minutes, as published in NPR. It works like a pregnancy test, according to its creators. However, Medecins Sans Frontieres sources have been reluctant to use the device citing a lack of reliability in the results after false positives. Furthermore, the device needs the approval of the US Food and Drug Administration in order to be tested outside the USA. In turn, the WHO is awaiting validation of other devices in order to improve the detection of Ebola. MIT is also developing a (5-USD) low-cost device that would enable detecting ebola, dengue and yellow fever in only 10 minutes. A single drop of blood would be enough to confirm if the patient has been infected or not. The use of molecular biology techniques would allow healthcare professionals to verify if the blood sample contains genetic material from one of the three previously mentioned diseases. At present, the device is in its preliminary study phase with animals. The British company QuantuMDx has created a mobile device named Qpoc Handled Laboratory that provides ebola, gonorrhea, HIV, tuberculosis and malaria results in 10 minutes. It costs 1,000 USD and each analysis cartridge can cost up to 100 USD. It is currently awaiting approval and its creators hope to launch it into the market later this year. This promotional video explains how the device works, based on molecular biology technologies for detecting DNA samples of the analyzed diseases. One of the most used devices for the detection of tuberculosis and resistance to rifampicin (frequently used antibiotic against tuberculosis) is GeneXpert MTB/RIF, jointly created by the University of Medicine of New Jersey, Cepheid and the US National Institute of Health. 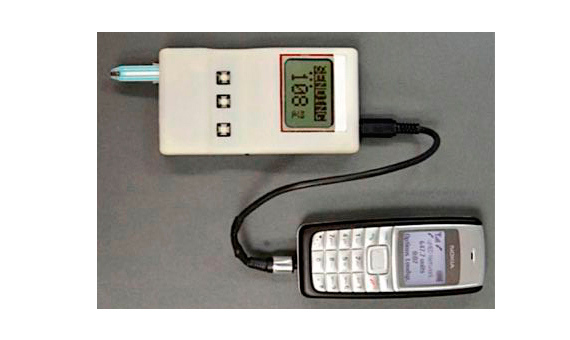 In late 2010, the WHO endorsed the device for the detection of tuberculosis in countries where the disease is endemic. The device provides results in two hours and is more expensive than the previously described devices. Still, its use has spread in South Africa and precisely in late March a shipment of 10 million cartridges to South Africa was appoved. 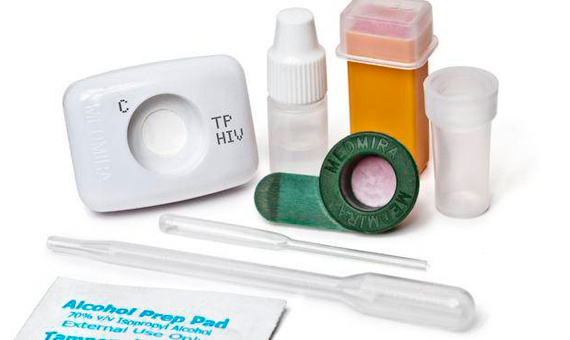 The Canadian company MedMira claims to be the only one in the world that complies with the current legislation of Canada, the US, China and the European Union for selling its diagnostic tests for HIV and hepatitis C, which provide results instantly. The company provides its devices to hospitals, laboratories, clinics and individuals. Recently, MedMira signed a 1 million Canadian-dollar agreement with a US holding company to expand its business in the US. The scientific community has shown that it is capable of assembling the best detection methods in low-cost devices. However, in order to eradicate these diseases in developing countries, there is a need for “constant investment, political will, an agreement between the public and private sectors, new forms of financing and work based on medical needs”, as concluded in the academic work Diagnostics for the Developing World published in Nature Reviews in 2004.